Pvilion's primary objective is to incorporate modern materials and technology into architectural framework, providing the structure with in-built renewable energy by using thin film solar panels. 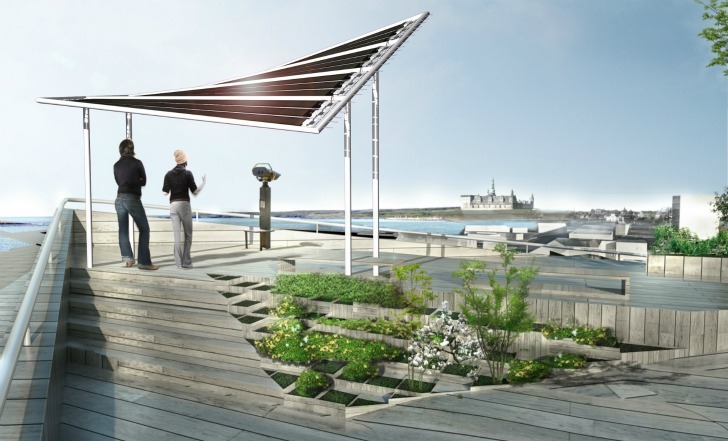 Integrating advanced solar technology with flexible stainless steel sheets, U.S. based Pvilion has created an innovative, energy-harnessing material that could eventually be applied to an array of architectural designs. Made of metal photovoltaic (PV) sheets, Pvilion’s pliable voltaic can be adjusted and re-adjusted to meet optimal sun capture. Currently, the company is focusing on applying the new technology to solar charging stations for battery powered vehicles, and to small to large-scale pavilions for events. Pvilion is a new start-up that begun operations just last year. Led by Todd Dalland, Robert Lerner and Colin Touhey, the team is drawing upon their decades of experience within the industry to modernize a flexible PV material that could harness enough energy to power any sized structure. The company has been quickly evolving, and on Monday they unveiled a brilliant, new solar car charging station in Austin, Texas. Their ultra modern works include solar charging stations for battery powered vehicles, special solar ‘event tents’, and solar pavilions. Operating from their Brooklyn factory, the company will continue working towards an all-encompassing design, engineering, and manufacturing strategy that is fully customizable.